When you say “landscape” I’m sure the vision you have in your mind is a panorama of a sprawling field, distant mountains or grand canyons taken with a super wide angle setting on your zoom lens. However, telephoto zoom settings can also be used effectively for landscape photos. When you zoom in on the details of your landscape, you can bring out something special. 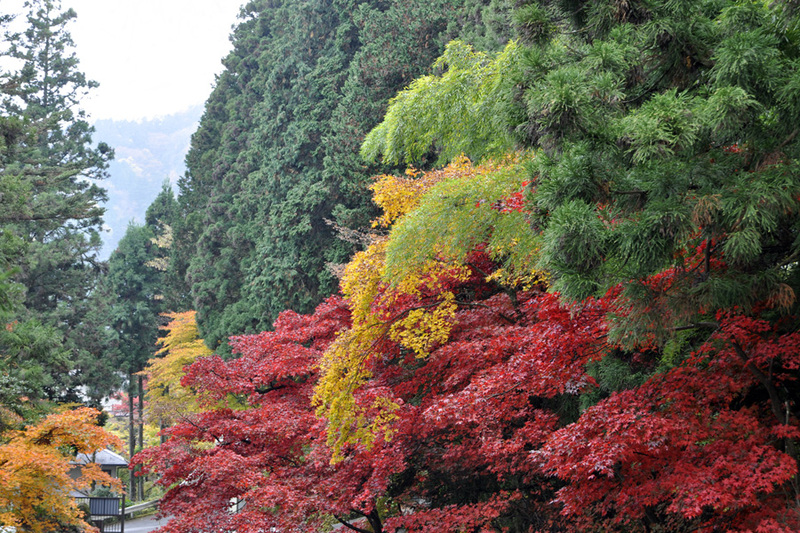 Here, in Nikko, Japan, I captured the majesty of the not-quite peaked fall season by isolating a few brilliantly colored trees clustered together in the still mostly green landscape. The resulting picture says “fall” unlike the wide angle shot I could have taken. Next time you’re shooting landscapes, zoom in and see what interesting detail you can find: a single tree, a mountain peak, a reflection in the lake, and more. When you use the telephoto setting, you compress the distance between objects and achieve a flat, almost painterly 2-D effect. This entry was posted in Composition, Travel and tagged composition, compression, fall, landscape, leaves, telephoto, travel, vacation by stacieerrera. Bookmark the permalink. WOW! Just look at the colours!! Gorgeous!!! I wish we’d branched out to some of the more rural areas when we were in Japan.